A coin that a New England man originally thought was a counterfeit has been authenticated by Numismatic Guaranty Corporation (NGC) as only the fourth known 1854-S Liberty Head Half Eagle. Described as “the discovery of a lifetime,” Numismatic Guaranty Corporation has authenticated and graded as NGC XF 45 the fourth known 1854-S Half Eagle. Photo courtesy of Numismatic Guaranty Corporation (NGCcoin.com). "It’s like finding an original Picasso at a garage sale. It’s the discovery of a lifetime; a previously unknown surviving example of one of America’s greatest coins," said NGC Chairman Mark Salzberg. "The owner of the coin is a life-long New England resident who wants to remain anonymous. He was stunned when we informed him that it is a genuine, multi-million dollar rare coin. 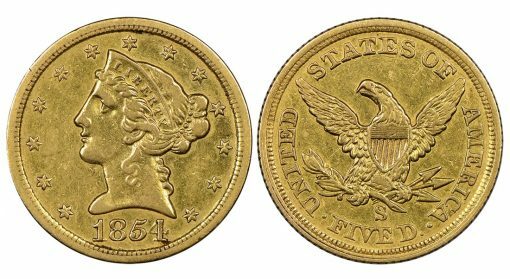 He had shown it to a few collectors and dealers at a recent coin show, but everybody said they thought it was a fake because until now there were only three genuine surviving 1854-S $5 gold pieces known," explained Salzberg. U.S. Mint records indicate only 268 Half Eagles were struck at the San Francisco Mint in 1854. One surviving example is in the National Numismatic Collection at the Smithsonian Institution in Washington, DC, one is owned by the Pogue family of Texas, and another 1854-S $5 has not been seen since it was stolen from industrialist Willis DuPont in Coconut Grove, Florida in 1967. "Our initial reaction on examining the coin from New England was utter disbelief that a rarity of this magnitude could still be discovered in this era. But upon seeing the coin in person for the first time it was apparent that the coin is genuine," said NGC President Rick Montgomery. "Upon carefully comparing the submitted coin to the images of the known examples in the Smithsonian and the Pogue Collection, it became quite clear that we were looking at a major find. We next sought to be sure the coin was not the stolen DuPont example. The DuPont 1854-S $5 was the same piece sold in the October 1962 Stack’s sale of the Samuel W. Wolfson Collection. After locating images from the Wolfson auction, we were able to determine that the coin in our offices was not the coin that was stolen from the DuPont family," explained Montgomery. Former American Numismatic Association President Jeff Garrett, co-author of 100 Greatest U.S. Coins, Senior Editor of A Guide Book of United States Coins (the "Red Book") and a rare coin consultant to the Smithsonian, described the revelation of a fourth 1854-S $5 as "a stunning discovery" after he viewed images of it. 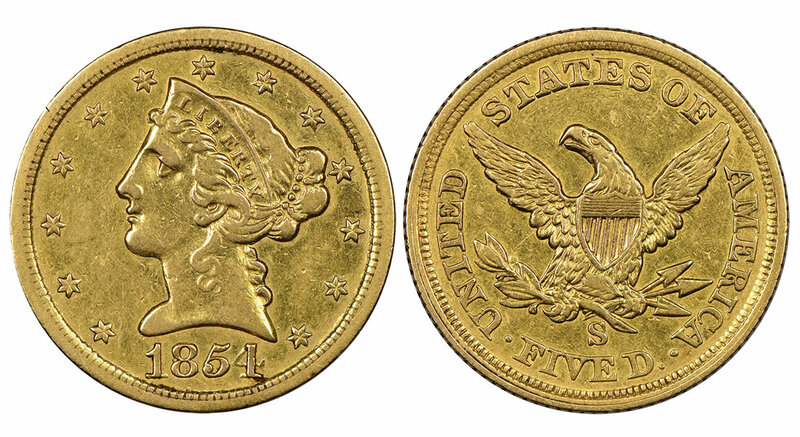 "The 1854-S Half Eagle has one of the lowest mintages of any regular issue U.S. coin made for circulation and is one of the first coins that came out of the California Gold Rush from the U.S. Mint in San Francisco. It’s always exciting when something like this appears. It’s stunning that a coin of this magnitude could come out of the woodwork," Garrett stated. "It’s like the ‘Antiques Roadshow;’ a very exciting discovery." This reminds me of the fortunate few who have found 1933 gold double eagles. The only difference being, that I’m not sure the 33’s are legal to own. Unlike this gem, the 33’s were never supposed to be released into circulation. Wish I would stumble into finding one of these rare treasures. Wishful thinking I guess. Wish there was more info about the remaining coins from the mintage. Were they melted down for some spurious reason or blended into the landscape ?